Premoistened wipes clean glass or polycarbonate lenses for improved vision, and provide anti-fog and anti-static treatment. Individually wrapped wipes store easily in a pocket or purse. Convenient, wall-mountable dispenser box creates easy access. Cleaning wipes also come in handy for cleaning computer screens. Silicone-free formula can be used even by employees with allergies. Length: 8"; Width: 5"; Packing Type: Box; Wall-Mountable: Yes. 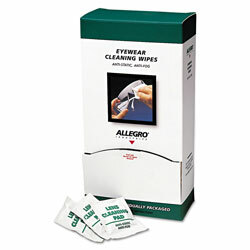 Safety Glass Parts and Accessories from Allegro! 1773 In Stock today.